Steve Woltmann | Loyola Athletics Loyola senior Orion Yamat follows through on a drive. 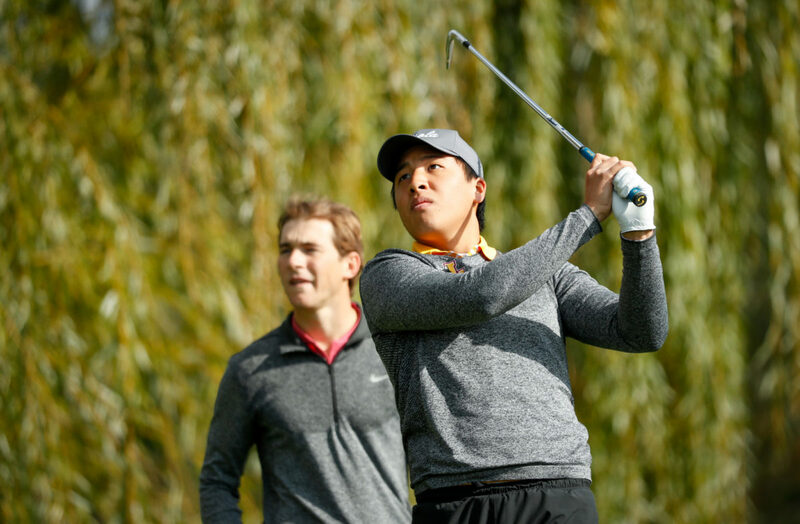 The Loyola men’s golf team’s hard work is beginning to pay off, its coach said, as it looks to capitalize on its improvement to finish strong in the upcoming Missouri Valley Conference (MVC) Championship. Head coach Erik Hoops said he’s been pleased with this year’s lineup, which has stood out from previous years’ on the course. Since it takes time for players to get adjusted and play at their best, Hoops said it’s taken the team a while to bring in members and get the whole team to the level they’re at now. The team has had a balanced roster this year with no single golfer carrying it, according to Hoops. He said it helps in competitions because it avoids pressuring one player, since a few team members can be counted on to perform well at each tournament. Senior Orion Yamat said this year, the team has gotten better at holding out through tournaments and not giving up after tough rounds. He said this had been an issue in past years, but this year they’ve been able to improve and keep working through those difficult rounds. Some of the players have placed in tournaments this year. Sophomore Tyler Anderson won the Zach Johnson Invitational October 1-2, and sophomore Devin Johnson secured the runner-up spot at the Crusader Collegiate September 17-18. Yamat also finished in seventh at the University of Northern Alabama Spring Classic March 25-26. Yamat said all the golfers on the team have the right attitude toward their goals, which isn’t easy to get. He said there has been good leadership among the upperclassmen and they’ve been setting a good example on and off the course. In past years, the team has had bad performances, which hurt the team’s overall results in tournaments. He said the team hasn’t had any extraordinarily rough rounds this year, which has led to better results. This year the Ramblers finished fifth out of 12 teams at the Zach Johnson Invitational after finishing eighth out of 12 teams last year. They shot 896 this year, 53 strokes better than the 949 they shot last year. Hoops said the golfers are most focused on their short-distance shots, as well as how they can improve their individual planning at tournaments. Every player has a different way they need to approach a course in order to perform to their strengths. Hoops said they need to work on individualized strategies. In preparation for the MVC Championship, the Ramblers have been able to practice outside more than last year due to the warmer weather, Hoops said. He said last spring’s weather wasn’t good for outdoor play, so he’s glad they can enjoy better practice weather before this year’s MVC Championship. The MVC course in Sunrise Beach, Missouri is fairly tough for long driving shots, according to Yamat, and the team will be focusing on shot accuracy to avoid obstacles such as trees when teeing off. He said they’ve been improving on these areas this year and they are better than they’ve been in previous years. At the end of last season, Hoops said he talked to the team members and told them to work individually over the summer, and their effort to stop finishing in the bottom halves of tournaments exceeded his expectations. The men’s golf team will compete at the MVC Championship April 22-23 in Sunrise Beach, Missouri.